Nicknamed “Hot Potato” because of his tendency to juggle the ball while getting ready to pitch, Luke Hamlin was in professional baseball for 20 seasons from 1928-1947, eleven seasons in the minor leagues and nine years in Major League Baseball. Luke was inducted into the International League Hall of Fame in 1955. Detroit Tigers – 1933, 1934. Brooklyn Dodgers – 1937, 38, 39, 1940, 41. 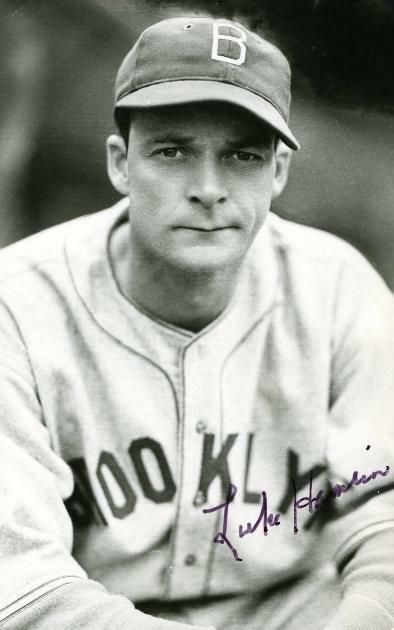 Hamlin’s best season was in 1939 with the Brooklyn Dodgers when he went 20-13 and had 10 complete games in 269-2/3 innings pitched. Hamlin’s 20 wins was 4th best in the National League, and he also finished 10th in the National League Most Valuable Player voting, one place ahead of Mel Ott.